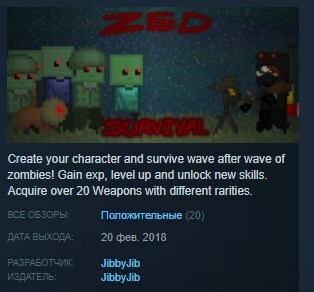 Create your character and survive wave after wave of zombies! Gain exp, level up and unlock new skills. Visit the shop between waves to buy weapons, ammo and other useful items. Explore further to get exp bonuses and better loot. How many Zeds can you kill before your inevitable demise? 4 Different stages with different "boss rounds"
A shop to buy weapons, ammo and more!